FRIDAY, Oct. 12, 2018 (American Heart Association) — Having optimal cardiovascular health as a child could predict the health of tiny blood vessels in the eye in adulthood — a finding that could serve as an early marker of heart disease, according to new research. “After comparing cardiovascular risk factors with the size and shape of retinal blood vessels, we were able to show that ideal cardiovascular health in childhood, and improvement to mid-adulthood, appear to have a protective effect on the retinal microvasculature,” said Dr. Robyn Tapp, the study’s senior author and a researcher at St. Georges University of London. The study’s findings highlight the importance of having good heart health “across the life course,” Tapp said. 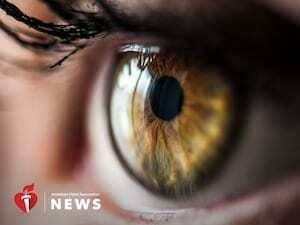 While the results don’t prove a connection between cardiovascular health and eye health, the study is a step in the right direction, said Dr. Mary Frances Cotch, chief of epidemiology at the National Institutes of Health’s National Eye Institute in Bethesda, Maryland. Tapp said her study’s topic needs further investigation, with a larger study population and extensive long-term follow-ups.